4′ x 10’8 Sections clamp carrier. Line of automated room temperature cold gluing and lamination, joints are dried naturally, to achieve maximum strength bond. Large I-beam frame & legs for max. rigidity and durability. Heavy-duty zine-plated clamp with huge 3/4″ diameter jack bolt for super strength. Caterpillar chain drive the clamp sections rotate powerfully. A select switch control for move on auto or manual mode. A most versatile and reliable edge gluing machine for wood working industry, laminating for laminate board, parquet, flat stock, table top, core black, truck flooring, turnings, up chair seat, queen leg and many other. The clamp tightener, with two pneumatic wrench for rapid tightening and loosening of clamp. 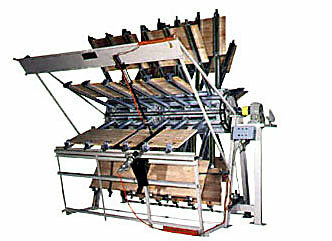 The two panel flattener is pneumatic powered to hold down the panels flat while clamps are tightened.